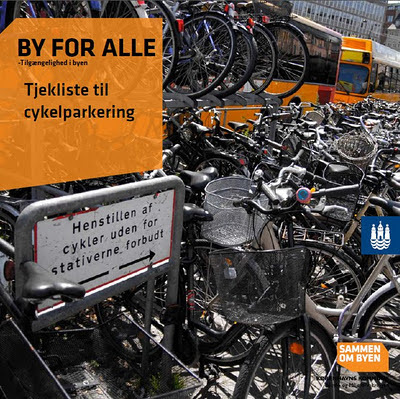 The City of Copenhagen has published a little folder called Checklist for Bicycle Parking - (opens as .pdf, in Danish). It is part of the City's "City For Everyone" (By for alle) strategy, based on the Principles of Universal Design. The City for Everyone strategy is mostly aimed at accessibility for pedestrians, mobility impaired, the elderly, etc. Here's an English brochure the City has about it (pdf). Here's a translation of the Checklsit for Bicycle Parking. What is good bicycle parking? It is not only of great importance to cyclists but also for people who use the space where bicycles are parked. Lack of bicycle parking - or badly designed bicycle parking - results in bicycles being parked in inappropriate spots and that restricts accessibility in the city. It is therefore very important that bicycle parking is included in urban planning and that is is designed correctly. Good bicycle parking makes it easier and more convenient for cyclists to move around the world's best bicycle city. At the same time it ensures better accessibility to all the things the city offers for all the other citizens. The checklist contains eight short and concrete considerations that should be included when creating new bicycle parking facilities. 1. Are the bicycle racks close to the destination? Maximum 30 metres away. 2. Are the racks placed optimally in relation to the destination? For example in relation to access. 3. Is there sufficient space between the racks to ensure access to them? There should be a minimum of 150 cm free space for putting the bikes in and taking them out. 200 cm is preferred. 4. Does the number of racks match the number of bicycles at the location? 5. The bike racks should be of a good quality - see the design manual - and have 50 cm between each bicycle. 6. Is there niveau-free access to and from the racks? 7. Does the location of the bicycle parking require lighting to achieve a satisfactory level of sense of security? 8. Does the cyclist have a good overview of the whole parking facility? This applies mostly to larger parking facilities in order to ensure sense of security. The 'City for Everyone' project has seven 'commandments' regarding accessibility that the employees at the City's Technical and Emvironmental Administration (Transport and Environment Dept.) must use when working in the development of more accessible public spaces. 1. The City should be designed for people of all ages with different needs. 2. We will work towards a safe, secure, pleasant, convenient and comfortable city. 3. Accessibility must be improved each time an employee of the Technical and Environmental Administration is involved. 4. Accessibility is a natural part of our daily work in the Technical and Environmental Administration. 5. Our point of departure is in existing solutions and processes. 7. Accessibility funds must give accessibility to the City.